A large open plan modern kitchen with masses of work space and large table that can seat 12. 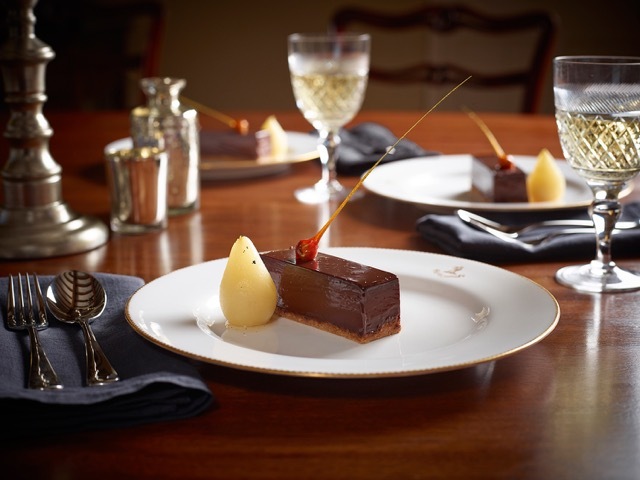 Equipped to a very high standard to satisfy even the most demanding cook including an American style fridge-freezer, two dishwashers (who wants to wash up on holiday? ), professional Falcon range oven, nespresso machine and separate wine fridge. 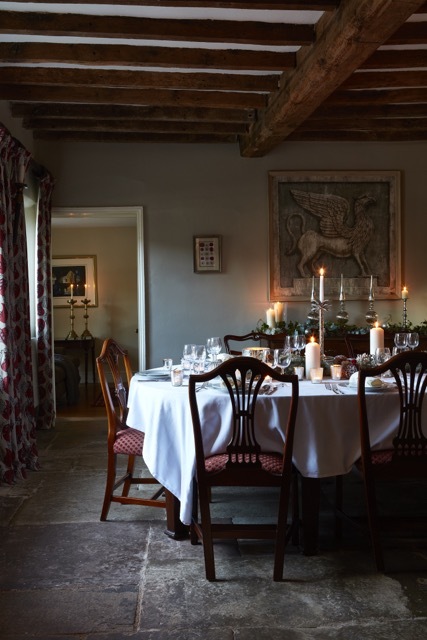 With it's original medieval cruck beams, flagstone floors and Elizabethan inglenock fireplace, this room is wonderfully atmospheric - the perfect setting for large celebratory meals. The oval mahogany table seats 20. 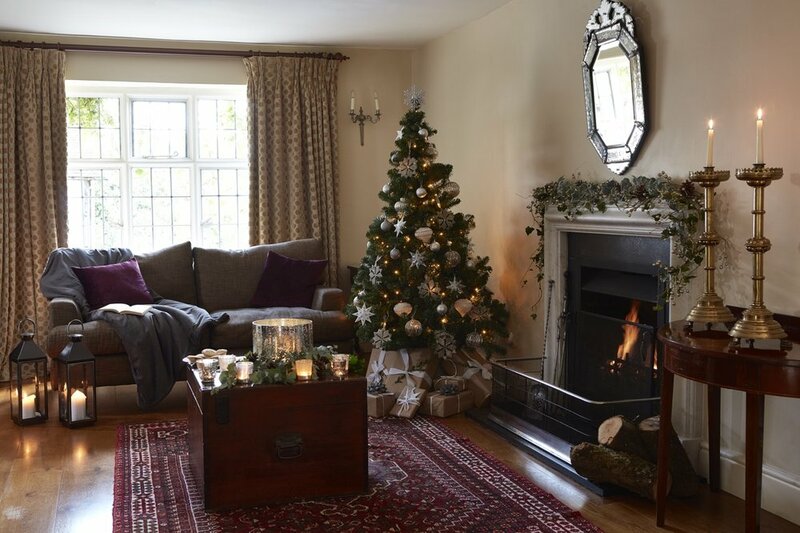 An enormous L-shaped sitting room with an open fire and plenty of squishy sofas for all the group to settle down for a drink before dinner or read the papers before Sunday lunch. 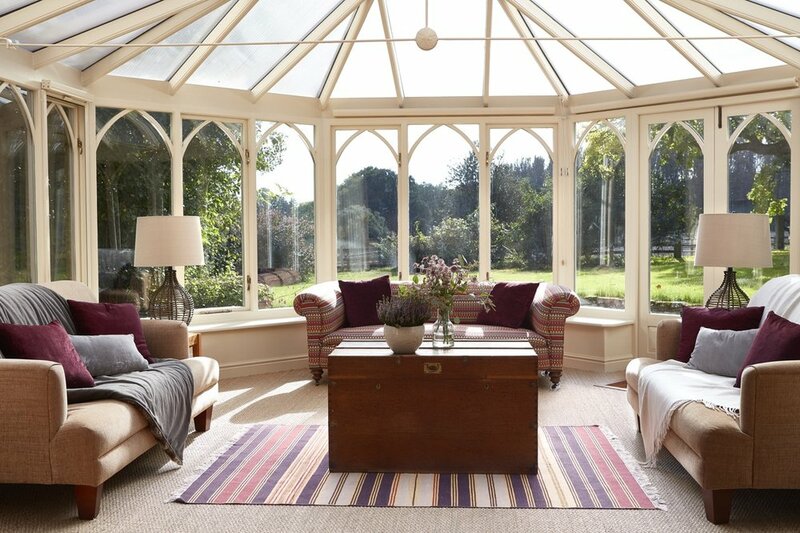 The conservatory extension has lovely views across the garden and over the fields beyond. There is a separate TV room elsewhere in the house to relax in with a vast sofa, wood-burning stove and 50" TV. Choose from Sky or the extensive selection of DVDs or books. Doors that open onto the large, sheltered, south-facing garden terrace. 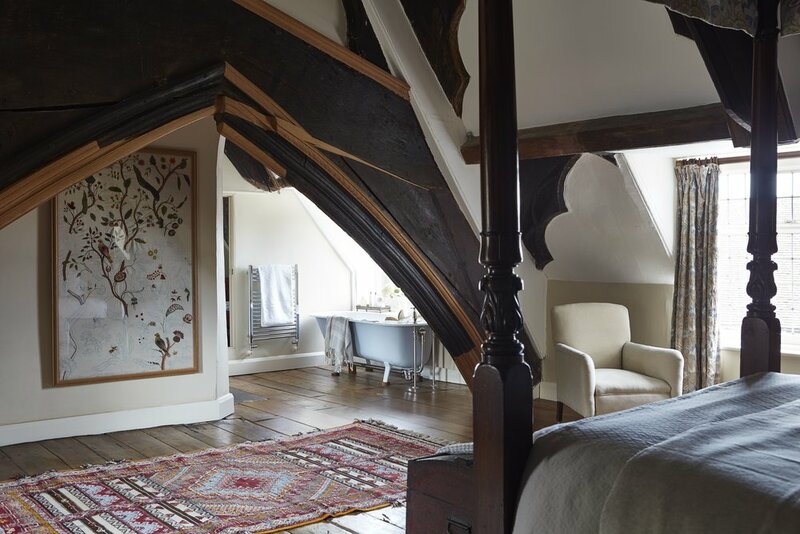 Upstairs, this light-filled bedroom was the 'solar' - the private quarters of the medieval Lord and Lady of the manor. During the restoration the original room proportions were reinstated and medieval painted decoration discovered on the cruck beams. It has a king-size double (that can also be configured as twins) with an ensuite bathroom. The medieval carved wind braces make this room unique. 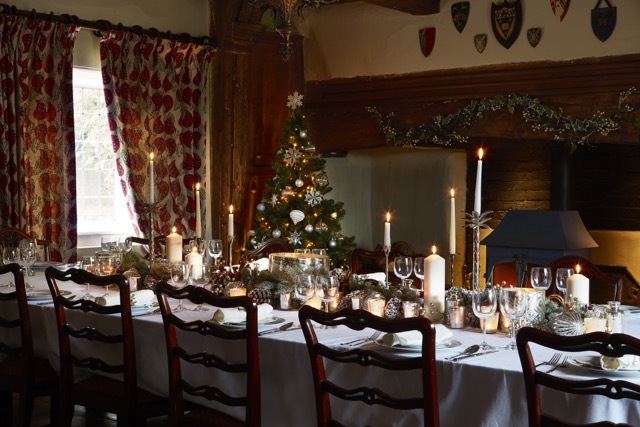 The centrepiece is a comfortable four poster bed and also boasts original Elizabethan polished oak floors, a roll top bath and separate WC. 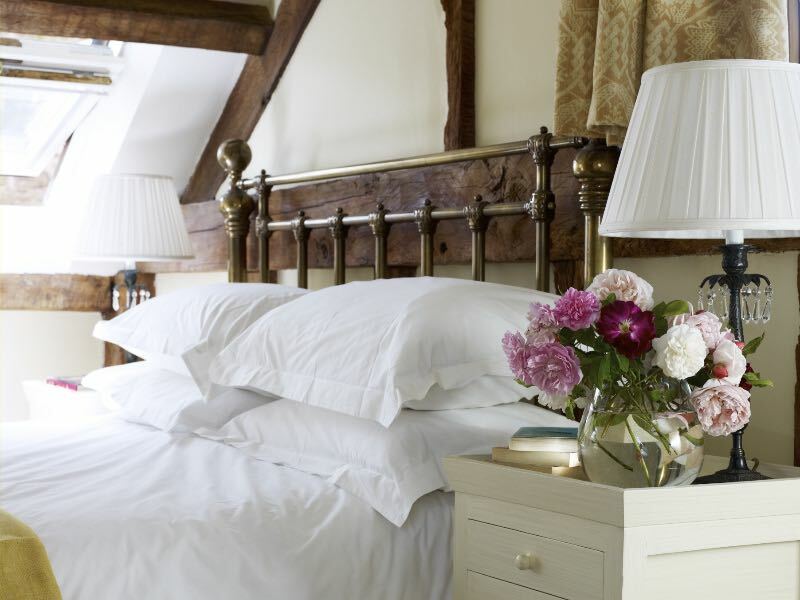 With its own ensuite with roll top bath, this bedroom can form two singles or a king-size bed. Its views overlook the picturesque Elizabethan barn. Duck through the ancient door into this charming bedroom where nothing is quite straight which gives it bags of character. It has a king-size bed and ensuite shower room. Bedroom 5 is a twin room but at over 7 feet long, the mahogany sleigh beds are very roomy. 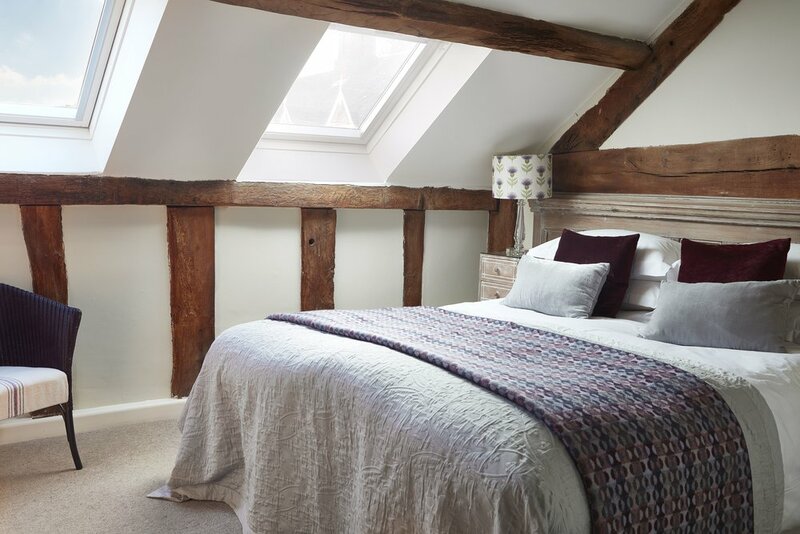 Next door bedroom 6 is in the former oast house with a double-height pyramidical ceiling into the oast and can be a king-size double or twin. These two bedrooms share an adjacent shower room. Although just steps away from the house and forming another side of the courtyard, the cottage has its own sitting room, kitchen and dining room to provide added flexibility if required. It has four bedrooms (two king-size doubles, one double or twin and one twin only room), each with its own bathroom, as well as a separate downstairs shower room. 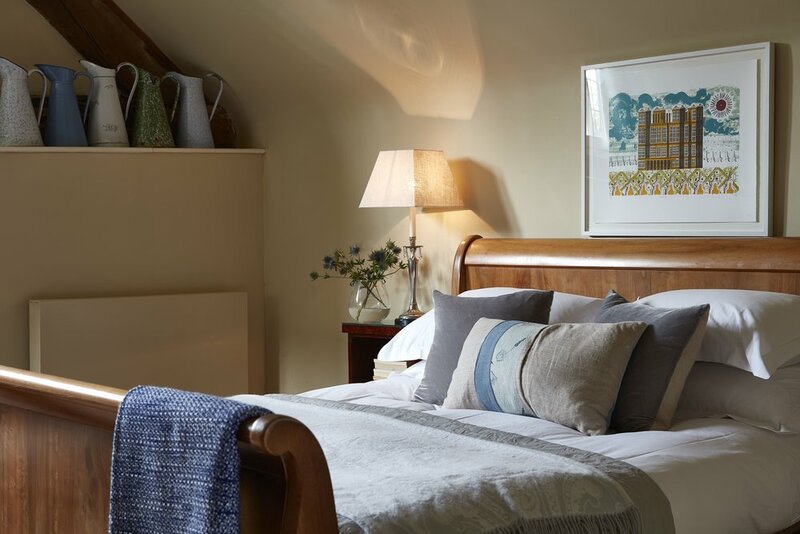 Reflecting the style of the house, the cottage is just as beautifully decorated and comfortable so no one will feel short-changed if sleeping here rather than in the house.